With all the talk of Thanos the last couple of months, let’s jump right into the middle of his previous most notable appearance: I’m talking about the Infinity Gauntlet mini-series. 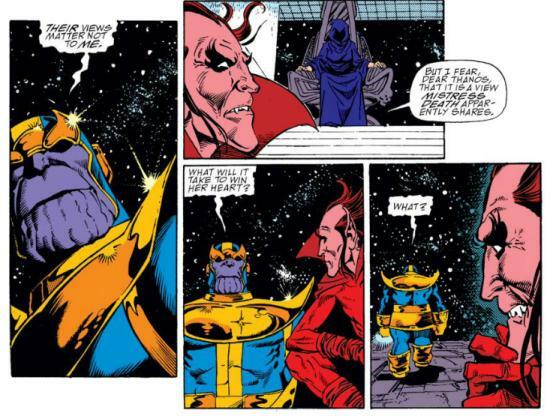 Thanos is still planning on destroying the universe in an effort to impress Death. Back on Earth, Nick Fury, SHIELD and the rest of the Avengers are trying to save people from the looming apocalypse. There’s a one page long sequence of Black Widow failing to save an elderly lady from falling to her demise that is kind of awkward. It doesn’t necessarily do anything to advance the story. Anyway, Adam Warlock is building a coalition of Earth’s mightiest heroes (and Doctor Doom) to combat Thanos, alongside some cosmic types like Drax the Destroyer, Firelord and Nova. But then there are some odd choices. Don’t get me wrong, Namor and Cloak of Cloak and Dagger fame are along for the ride. But at the same time, why them? And this is coming from someone who really likes the characters. Getting back to the story, Adam Warlock makes an appeal to the most cosmic deities in the Marvel Universe to help him save everything. So after begrudgingly getting them on board, it’s off to save the day. This issue, and the whole series in general, works thanks to the creative team. Jim Starlin’s writing works so well with this, as he either created or revamped most of these characters at some point. On the art side, George Perez does a heck of a job. He really does an amazing job at handling all these characters. Infinity Gauntlet is a really fun super crossover that I kind of forgot about. It makes me feel really old remembering it came out twenty-one years ago. Time flies when you’re having fun. This entry was posted in Uncategorized and tagged adam warlock, george perez, infinity gauntlet, jim starlin, marvel, thanos by Chris. Bookmark the permalink.